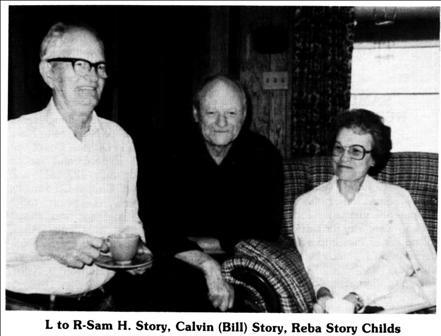 Calvin (Bill) Story, son of Louis and Pallie Green Story, was born at his father’s farm at Wesley Chapel, west of Crockett, Texas on October 15, 1918. 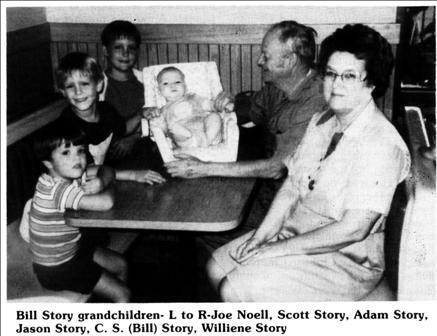 When he was a few weeks old, his family left the community of his paternal grandparents, Sam Houston and Rebeca Waller Story, and bought a farm in the Sunset Community east of Grapeland where Bill and his three brothers and two sisters grew up. His school career began at Enon where he attended for three years before transferring to Grapeland schools. About this time he learned the benefit of applying his own mind to make deductions. On Christmas morning he was pleased to find a beautiful red wagon left for him under the decorated tree. Later he was surprised to find wagon tracks right to the front steps so he reversed the way, following them down the road to the home of his maternal grandparents, John Calvin and Mary Lou Browning Green. He had discovered Santa’s hiding place, and perhaps the very secret of the old, red-suited fellow’s identity. After graduating from Grapeland High School, Bill attended Sam Houston State Teachers College in Huntsville from October 1941 through October 1945, he served in the First Calvary Division of the United States Army, twenty-eight months of which were spent in the Pacific area including Australia, New Guinea, Admiralty Islands, and the Phillippines. He was with the unit that freed the prisoners at Santa Tomas University in Manilla and received the Bronze Star Award. The war over, Bill returned to Sam Houston State to complete work on a degree in speech and to his part-time job in Duke & Ayres. He sang in the college choir and had the lead in several plays produced by the drama department. In April of 1946, Bill married Williene Smith, a native of Huntsville, daughter of Mary Traylor and William Bradley Smith, graduate of Huntsville High School andSam Houston State Teachers College. She had been employed by Dow Magnesium Corporation in Freeport, Humble Oil and Refining Company in Houston, and the United States Employment Service at Huntsville. 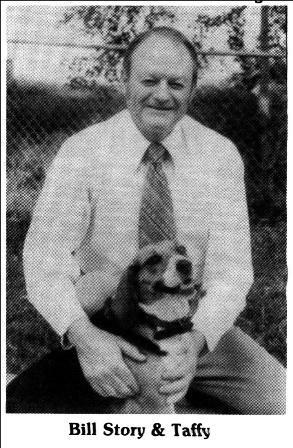 After teaching one year at Corrigan High School, Calvin returned to Sam Houston College to earn a masters degree in chemistry while Williene taught a course in freshman English and one in sophomore English at the Country Campus. Bill then taught six years at Nacogdoches and seven at Tyler, Texaswhile using the summer to study at the University of Houston; Baylor University at Waco; American University, Washington, D.C.;Colorado Agriculture College at Fort Collins, Colorado; Colorado State University at Colorado Springs; and the University ofColorado at Boulder. During the next nineteen years, Calvin worked as science consultant and head of the Science Curriculum Development Department at the Texas Education Agency at Austin. He served as President of both the Texas Science Supervisors Association and the National Council of State Science Supervisors. Williene taught twenty-two years, twenty of which were with handicapped students at Tyler and Austin while training over twenty-five student teachers. Children born to this union were: C.S. (Happy), Jr. on March 9, 1947; James William, February 7, 1950; Mary Camille, June 14, 1953; and Andrea Lyn, July 9, 1963. Happy, Navy Veteran of four years in submarines, is a graduate of Southwest Texas State University in law enforcement and works as ballistics specialist with the Austin City Police. He is married to the former Judy Keel who also attended Southwest Texas State and now works in the school offices at Round Rock, Texas. Their children are Adam Bradley, born March 14, 1976 and Scott Emery, born September 24, 1978. James, who holds a B.S. degree in business and a masters degree in city planning from the University of Texas, worked several years at Austin National Bank and a consulting firm and is presently employed with the State Comptroller’s Department. His wife, nee Doris Ann Lane, also had two degrees from U.T. and is a registered nurse. Their son, Jason McLane, was born May 17, 1985. Camille majored in home economics at U.T. and taught several years in private kindergartens before retiring to be with son Joseph William who was born April 2, 1981. Her husband, John Noell, another U.T. graduate with two degrees, is president of his own engineering company. Having married Robert Wiliam Clark on July 7, 1984, Andrea is continuing her studies in special education at Stephen F. Austin State University, specializing in visual impairments. She has just completed her internship with the Cris Cole State Center for the Blind in Austin. Bob has transferred from U.T. to finish his major in English at Nacogdoches. All of the Story children, graduates of various high schools in Austin, played in the band and all were active in scouting, both boys achieveing the rank of Eagle Scout and earning God and Country Awards while both girls received comparable merit badges. This whole family has been active in the work of the Christian Church (Disciples of Christ) and has participated in the different choirs. Bill sang with the Ben Hur Chanters of the Shriners. Bill is executive secretary of the Science Teachers Association of Texas and mixes hauling, hay building fences, and seeing to the cows with these duties. He is a past patron of the Augusta order of the Eastern Star where his wife is secretary. His standing in the Masonic Order is of a forty-year duration and he is Worshipful Master of the Augusta Lodge. Both of these Storys take part in Sunset Christian Church activities and the Houston County Historical Commission. Williene is a member of the Daughters of the Republic of Texas. Retirement in Houston County is delightful and Bill is still as pleased about it as his beloved beagles who have room to roam and chase rabbits.